L.A. area fashion fans, stylists and designers are really hyped about this new vintage clothing, jewelry and collectibles show that is ramping it up with even more top notch dealers from all over the US and beyond in preparation for its Oct. 12-13, 2018 debut at Fairplex in Pomona, CA. HUNTINGTON BEACH, Calif. , September 21, 2018 – LA Vintage Rendezvous is set to premiere at The Fairplex (home of the Los Angeles County Fair) in Building #5, located at 1101 W. McKinley Ave in Pomona, California on Friday and Saturday, Oct. 12-13, 2018. This is a brand new vintage clothing, jewelry, and vintage collectibles event in the Los Angeles area that is planned with all levels of buyers, designers, stylists and the everyday vintage fan in mind. 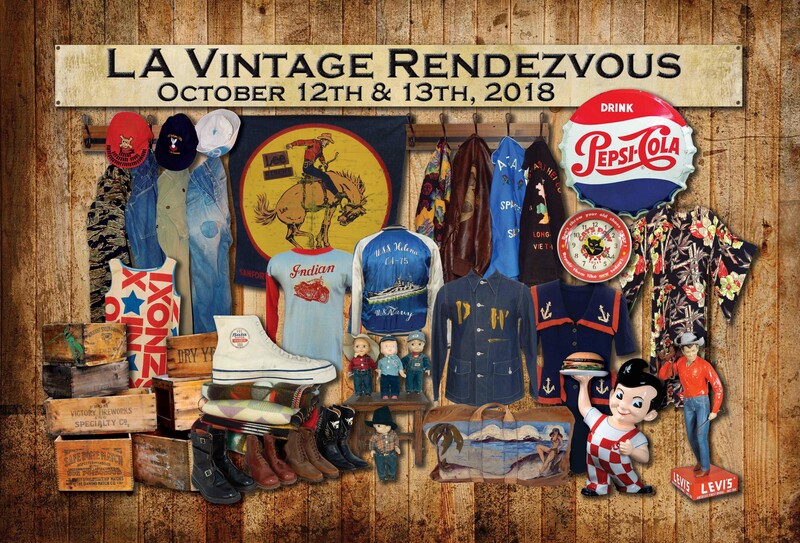 Vintage Productions is pleased to bring you its newest endeavor, LA Vintage Rendezvous, a unique vintage clothing and collectibles event featuring what is sure to be an impressive variety of vintage clothing. The aim is for great choices for that mid-to-high range budget in unique women's wear and accessories, in addition to hard-to-find menswear, workwear, denim, camo and more, as well as vintage paper and ephemera, some impressive advertising and fun vintage collectibles. Featuring top dealers from all over the U.S. and beyond, this show is to be held at the Fairplex in Pomona in beautifully upgraded Building 5. This kick-off event will be held Friday, Oct. 12 and Saturday, Oct. 13, 2018. LA Vintage Rendezvous appreciates how important the Fashion Institute of Design and Merchandising FIDM is to fashion education and recognizes how these future designers, stylists and buyers can fit into the world of vintage apparel, and vice versa. It is the goal to help young FIDM students experience and appreciate what vintage can mean to them. By inviting FIDM students to this show, the hope is that it will help them learn something fun and new as they delve into the many facets of today's fashion industry. It is with great pleasure to announce that a variety of excellent vintage dealers will be attending, all presenting their unique items at this kick-off event. LAVR welcomes John Gluckow of Strongarm Clothing and Supply out of New York; Ross Kuhn and Michael Maker of Big Foot and Wild Boy; Brian Cohen of Snappy Gabs and Vintage On Hollywood; Rin Tanaka of My Freedamn and the Inspiration LA show; Kathleen Schaaf of Meow Vintage out of Long Beach, California; Margo Essman of Bungalow Blondie with pin up paper/ephemera; Elizabeth Jones and LLoyd Tripp of Sugar Shack Vintage in Texas; Adriana Davis of Frecklebug Vintage; Mike Karberg of Blue Mirror Vintage; James Maley of Atom Age and The Glendale All American Toy and Advertising Show; Hitoshi Yamada of Archives from Japan; Michael Lara of Mikos Thread Salvage; Utaka Imamura of Tidemark from Japan; James Riley of American Blues Trading @americanbluestrading; Randy Jones of Tiki Ranch Vintage; Stan and Constance Garvey of Recursive Chic; Clutch Magazine from Japan; Robert Alvarez of Straight 8 Vintage; Kristi Alvarez of Vintage Blue Moon, Ron Ede of Junk for Joy; Tim Robbins of Wild Blue Yonder Collectibles in Arizona, Brit Eaton of Carpe Denim, Little Darling's Pinups for Pitbulls (a 501c3 charity), Sarah Chamizo from Embers/Cinders, Donna Knott with Donnaland Vintage Variety, Ellen Winer/Marilyn Millen vintage jewelry, Connie Parente from Los Angeles with her well known, premier vintage jewelry, Joe Cutajar of JC Jeans, Jack Kalajian with KrimeWear, Kristine Anderson with Wear it Again Sam out of San Diego, Silver Suite Antiques out of Arizona, Isawa Motonori of Kyoei Vintage Clothing, Hot Couture Vintage out of Santa Rosa, and many more. LA Vintage Rendezvous is pleased to be working with Melissa Kehoe, Instructor Fashion Institute of Design & Merchandising, Business of Denim Adv. A.A., International Manufacturing & Product Development Adv. A.A. and Tricia Edwards, Fashion Institute of Design & Merchandising Assistant Department Chair Special Projects as LAVR welcomes students and staff from the Los Angeles FIDM campus as special guests to this fun, new event. LA Vintage Rendezvous appreciates how important the Fashion Institute of Design and Merchandising FIDM is to fashion education and recognizes how these future designers, stylists, and buyers can fit into the world of vintage apparel, and vice versa. It is the goal to help young FIDM students experience and appreciate what vintage can mean to them. By inviting FIDM students to this show, the hope is that it will help them learn something fun and new as they delve into the many facets of today's fashion industry. As an added bonus for Oct. 12 Friday evening VIP shoppers, and as a special thank you for dealers, LA Vintage Rendezvous is hosting The Paladins as a special musical guest. The Paladins from San Diego, California are the preeminent blues/rockabilly band in America. Founded in 1980 by guitarist Dave Gonzalez and bass player Thomas Yearsley, they have recorded five singles, nine full-length studio records, and three live albums. Along the way, they built a solid reputation as one of America's hardest-working and best live bands. It is exciting to welcome them to LA Vintage Rendezvous 2018!